VTC is conducting case-study research to review the traffic, circulation, economic and community impacts of state highway bypass projects. 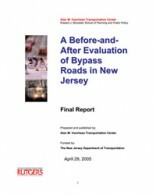 (Client: NJDOT). April 2005.